At the time of writing this post I must say that I feel like a hero! That feeling is wonderful you know, when someone has a problem with their computer and not a simple but a HUGE one and you are able to repair em you turn to be that people hero. Today my friend Avaco12 made a little mistake while installing bootcamp on her iMac, she left her external (200GB) disk connected, and when Windows asked her where to put the new Partition she accidentally selected her preciousus external drive, when she realized it was already too late, windows had already destroyed the partition table on her disk. She had 1 HFS parition and 1 FAT. She was crying because she said she had her entire life on that disk, so she asked me for help and I started researching what could I possibly do to repair the disk or at least retrieve her data. There are plenty of solutions out there, some of them are really expensive, and people on the forums are not very happy with them so I wanted to look at little more into the issue and I came across this solution called TestDisk which is an Open-Source Multi-platform solution for repairing disk partitions. I gave it a try and awesomely I managed to fix the disk using TestDisk and the pdisk utility. When I called Avaco12 to tell her that I fixed her data she was so happy she couldn’t stop smiling she told me I was her Hero and so that’s how I felt, the process wasn’t easy specially because noone talks about how pdisk works on Mac OS X.
Here’s how I did it , hope it works for you. 3.- I issued the command ‘sudo ./testdisk’ it indetially promped me to make my terminal bigger =P, after doing so It displayed me a simple disclaimer and then a notice telling me that TestDisk could Log all the activity if I wanted to. I selected Yes and continued. 6.- ATTENTION: TestDisk will quickly search for partitions on the disk and display you information about it on your disk. Take note of the information it will display you, since you’ll need it to repair the disk later on with pdisk. Note: if you try to repair your partition table with TestDisk it will fail since that function is not yet implemented. 10.- Now we are going to need the info from Step 6. type the command ‘c’ and press enter, it will ask you to type down where your first partition starts, how long it is and how you want to name it. repeat this step for every partition you have. 12. type ‘q’ to quit the application and go see for yourself if your disk appears now in Finder. If it does, go to Step 13. else try disconnecting your external hard disk and reconnecting it. After Mac OS X 10.6.7 it is suggested that you restart your machine and reconnect the disk. If this fails try again from step one. Don’t worry about rewriting the partition table it doesn’t harm your data. 13. You are a hero, no matter if it’s your own disk, you just saved your data! Now go back to the ANALYZE step continue from there. Thanks to Stan Alien for the heads up. Congratulations, and I hope this information is usefull to you now remember to backup your data! Personally I recommend Backblaze. Posted on March 8, 2013 by perrohunter. This entry was posted in Uncategorized. Bookmark the permalink. I really owe you my life, this blog has saved me a lot of time of formatting, repartitioning and installing all my OS’s again. Although I had to dig in some other blogs as well, because it was on my main hard drive, not external, so after I did the very idiotic mistake by deleting my partition table, I couldn’t do it while I’m booting from it. I was also afraid to reset, because I won’t be able to boot from it again. Finally I managed to boot from the CD, but not using its terminal, there was another way, using CMD+S, it took me to another like-terminal environment which I did all your instructions and it finally worked. But I still have one small problem, the partition table created is Apple partition map, not GPT, so do you have any idea how to do it? and then it gives me Quick Search instead of Quick Analyze, when I click Enter, it seems is going through all the sectors of my 3TB hard drive and it never ends! I’ve been at it for hours and is still at 1%. Is this the only way to get to next step? I’m trying to recover circa 1.8 TB of data from a 2 TB Seagate Expansion Drive that was accidentally formatted. It began formatting using Mac OS Extended (Journaled) but within three seconds, when the mistake was realized it was unplugged while still mounted. The drive will not mount so I used Data Rescue 3 to clone the drive to a fresh 2 TB Seagate Expansion Drive and see if it would work. The new drive mounts and shows all the folders and files – but none of them will open. The files are mostly Quicktime Pro Res files, with some as big as 30gb. And this list goes on and on, this is just a part of it. Structure: Ok. Use Up/Down Arrow keys to select partition. >dr-xr-xr-x 0 0 0 21-Feb-2014 11:53 .
dr-xr-xr-x 0 0 0 21-Feb-2014 11:53 ..
To my disappointment it only lists the files that were on the original drive before I ever used it. Could these be the problem? Hardly? This is strange? Why does it not list all the files and folder I see when I mount the drive? 8.- Issue the command ‘sudo pdisk /dev/rdisk1′ (where /dev/rdisk1 should be the same name you chosed on step 4). If you type the command ‘c’ and hit enter it will tell you the following…. Can anyone be of any assistance? I’m hoping that there is some hope as so many people have been able to fix drives using this blog. Given that you can see your files, perhaps all you need is a “sudo fsck.hfsplus -f /dev/sdb1” (if “sdb1” is the partition with your data). The number in “/dev/disk1” should be a partition number, which is weird considering it appears to find partitions in there. In my case i started testdisk with “sudo testdisk” and selected “/dev/sdb”. In Testdisk, use the left/right arrow keys to change the D(eleted) signs of the largest non-overlapping partitions. I’d try writing a partition table with the latest version of TestDisk, where “EFI System 6 76805 76800 [EFI]” and “Mac HFS 76806 488345871 488269066” are not Deleted and at least one of them is Primary. Hi! Thank you so much, I have a question for some reason when I type “sudo” I get nothing. What does that mean? I’m new to this and trying to repair an iBook I want to donate. Thanks!!! Which OS are you using? On Debian-flavored distros of Linux, e.g. Ubuntu, get TestDisk using “sudo apt-get install testdisk”. Keep reading and Googling keywords and error codes. I have a similar problem: My RAID 1 system failed and now I have two 4TB HDDs that won’t be recognized by the system. I followed your steps, but the pdisk sais “the map is not big enough”. Have I done a mistake? It would be great if you could help. “the map is not big enough” means that Length in blocks: 7813250992, is greater than new size of ‘device’: 4294967295 blocks. You cannot map areas that don’t fit on your device. I’m having the same problem. My original partition was the majority, if not all, of my 2 TB portable. The data is only 650GB. Is there no way for me to reverse this? It is normal to take so much time analysing ? It runs for hours and it is not ready yet. I followed your instructions, but still get the same error. I read in these comments that I may need to change my block size to reflect a larger drive. I am fearful that I may irreversibly destroy any chances of my partition recovery if I enter in a different size during the “i” command. So for a 1TB partition, what do I put for physical block and logical block? Worked like a charm thanks man ! Holy god, you are my hero right now! Bootcamp snuffed my partition table, but the world has been made right again!!! THANK YOU!!!!!! I manually fucked up my 500gb backup drive when attempting to make Windows 7 read NFS+ drives, and I thought I had lost it all when OS X didn’t seem to read it. Thanks to you, and TestDisk, I got my data back! I have never been this happy in a long time! You are da man! My 1T external became unreadable and unrepairable after an app crashed while copying files. Your procedure worked like a charm. Does anyone know how do fix the Mac partition from the Windows partition? I already have the log from TestDisk. Hi, I used the installation disk of mac osx after retrieving the data from test disk, booting from dvd. Now the problem is that pdisk gives a “Resource Busy” error. If I try to mount the disk it says “Resource busy” again. I believe there is no partition map (as pdisk says that but he’s unable to write a new one). The fact is that I can’t boot from MacOSX on my macbookpro as it doesn’t see the Machintosh boot drive, but it sees the bootcamp partition (MBR) it start and then Windows sees the Machintosh drive and I can copy the files, but still no luck with booting from it. This is really weird. Any ideas? Great info, thanks. I was wondering if it could be done for HFS+. One thing though, your first screen shot, 36.png, just takes me to the main blog page when I click on it or try to open it in a new tab. Thanks again for the great tutorial though. @jim: hey Jim, I’ve fixed that broken link 🙂 sorry I’m transitioning the blog to a new platform. All the steps until pdisk worked like a charm. But pdisk, after hitting command “i” tells me the disk is busy and cannot access it. Any ideas how solve this ?? I was able, however, to view the partition map scheme from Testdisk, so I tried your method in Pdisk. command ‘c’ –> when I do the big partitions, I get the “Can’t read block x…” errors again. I’ve had to have TestDisk run a deep search and now I have way too many choices for deleted partitions. Great. We’ll see how this turns out. Good to hear that people out there are getting their data back. The issue you are facing is most likely the need to unmount the drive in question before you can perform low-level operations on it. You can open up DiskUtility and click on the drive you are working with and then click the ‘unmount’ button on the tool bar. You could also run the command ‘diskutil diskX unmount’ if you are already in the terminal. Hi, thanks for the advice. Disk utility took it upon itself to destroy the partition map for my external Hd, I’m currently trying this method as nothing else I was able to find seems to have any suggestions for the issue – hopefully this will work. I was just wondering how long it ought to take pdisk to perform the remapping? (I have a 2TB drive – process is still working and I’ll leave well enough alone for awhile). I’m just looking for a ballpark figure so that I may know whether to assume that it has failed or not. hi, i did it but now the disk is not readable by my mac! I tried to access pdisk from the terminal under the Snow Leopard disc and it said it was an unknown command. Hello Perro, i send an email with screenshots to your gmail. can you let me know whether you received my email? thank you very much! It perfectly worked… I recovered a partition with 250 GB of data which disappeared due to a corrupted partition table! but I wrote something wrong, and puff! Gone partiotion table ! Hello completely wrong partition table ! Then I downloaded the latest version of testdisk to a usb drive, restarted my macbook with an ubuntu live disk and ran the testdisk in a terminal. I mounted the usb (mount /dev/sdb1 /media/usb), ran the testdisk utility from the usb stick (in my case testdisk_static), followed your instructions untill step 6. Then for some awesomeness ! The latest version of testdisk now supports the option to write the partition table for you, based on what it finds analysing the drive ! So I simply choose the “write” option, rebooted and everything worked again ! I have same problem as your friend facing, after follow your instruction i have facing some problem on the Pdisk command after i run the testDisk, I am using Mac OS X Lion. Is it anyway to retreive back my files in my external hardisk? Thanks. it’s worked for me !!! Thank you very very much!!!!!!! @差点要哭出来了… 不小心删除一个mac分区… 找了几个mac数据恢复软件.. 都木有成功恢复, 有的恢复了文件但不能打开…折腾2天了…. Restored my sisters macbook external drive. Thanks to the author of this guide, he just saved my 2TB external drive, of which yesterday I wipe out its partition map. Interestlyng, I had to follow a slightly different procedure, because my external drive is formatted with an EFI-GPT map, and not APM. I followed this guide, but when I tried to create an Apple Partition Map with pdisk it always failed with the error “the map is not bight enough”. Since APM max size is 2TB, it looks like that my drive is slightly bigger, at least to make pdisk and APM fail. As you can see it’s very similar to pdisk, and you need the same information: first block and length in blocks. After this, I have reconnected the drive to my mac and it worked again. Thanks again to the author, I wouldn’t have find this solution without this guide! One final notice, now even if the Finder and Disk Utility both can see the 2TB HFS partition, Disk Utility is unable to repair the GPT map because it can’t find any partition. It looks like that I haven’t perfectly recreated the GPT, but it’s good enough to copy all the files on another drive. Man, I can’t thank you enough!! I’ve been strugling with several demos of paid apps and nothing helped, even this tutorial didn’t help until I saw your post. That did the trick! I have the same problem: “Map is not big enough”. So I tried the got command, but I received the following error: “error: device already contains a GPT”. Do you have any idea, what I could do now? I’d appreciate your help a lot! In the end, neither testdisk and pdisk were not utilized in actually fixing the problem. Fam, you are the bomb. I had the same issue you did until I tried got and now the drive is back to life. You are a godsend and I cannot thank you enough for posting and sharing your knowledge. Know that you have made someone’s day. Thank you, thank you, THANK YOU!!!!! YOU ARE MY HERO, just recover a 3T ex-disk, 3 epsiode documentary back!! and THANK YOU, perro, I really want to hug you guys! Mmh, para algo asi, no es mas sencillo usar explode()? Ahhh! Thank you! ¡Muchas gracias! ¡Eres asombroso! hey man, got in to trouble! i have a 500 gb HDD from a lacie EDmini HFS partition on which i fried the usb so i had to access the data your way. I plugged the HDD in a G4 mac and use the terminal. i had 5 partitions but none could be accessed. @Andre, you erased the disk my friend. That is not a partition problem, you just wiped it. Try data recovery progs, but really, it’s gone. now i’m trying to use TestDisk, but after i select my error hard drive, the TestDisk just froze and do nothing. i tried to wait, but nothing seems to be happening. can you help, please ? And so are you. Un millón de gracias! YOU SAVED MY LIFE! THANK YOU THANK YOU and THANK YOU!! Hey i try this but i have partition which is HFS n NTFS on my 1TB external HD. but its only choose HFS in the first choice. How i can use it for my HFS n NTFS in the same time when quick analyze…or i must do this twice…..1st HFS n after i repeat again for NTFS??? At step 10. when I write the numbers on every of 4 partitions, it says “the map is not big enough” each time. Any clues on that one guys? I have a 500 GB disk that only had one partition on it, the “Macintosh HD”. It’s a clean install of Mac OSX Snow Leopard, so I don’t know whether the EFI stuff is on an extra partition. Anyway, when I analyze it with testdisc (version 6.13), it can’t find any partition to repair (is it correct to select “Mac”? All I need is the info from Step 6 so I can enter it into pdisk. Is there any way to get it without scanning the hard drive for weeks? @FAM, I found the solution to your problem. I too was experiencing the error, “the map is not big enough” and couldn’t rebuild my partition map. Once I finished entering the last command in Terminal, the disk immediately mounted on my desktop. Next, I tried to use Disk Utility to repair it like he mentions, but it failed. I then used DiskWarrior and THAT finished up the repair just as he said. My disk works fine!! It mounts no problem. No data lost. Initialize – Ignore – or Eject! Without seeing the Disk I can’t run Disk Warrior, it doesn’t appear on the Menu! Any help would be happily welcome. I need a help. I’m trying to expand my boot camp windows partition, but I converted my disk to a dynamic disk accidentally. Now my entire disk in my iMac is a dynamic disk, and I’m not able to boot to OS X. How can I revert the process without the loss of data? I’m able to boot Windows 7 but I don’t know how to resolve this problem without losing all my data in mac partition. I tried use TestDisk but I don’t understand how to use it especially when choosing which drive/partition and partition type. I’m not sure of it. i borrow my sister laptop md313 and want to install windows 10 ,accidentally made a volume in disk management in windows,then mac doenst boot..just windows can use……….pleeeeeeez tell me what should i do with this program or anything else thanks……. Clear, simple instructions let me recover after disk utility on PPC wiped the partition map when I tried to manipulate a drive with multiple partitions with different filesystems on them. Thanks for posting this. Saved me 630Gb of data. Im having the same problem as Jakob at the part where it scans the drive but shows 16% after nearly a day. Is there any hope left or could i just map the whole drive as one partition? It only had one when the data was lost. this is great! but i have a problem. i am trying to repair a g-tech g-speed q and it is setup as a RAID array. it has four drives and they all show up when i analyze. i did just pick one of them and tried to follow the instructions to completion but then i run into the “the map is not big enough” error. so, does it matter what drive i pick of the four? i saw the instructions from @drew )http://forums.macrumors.com/archive/index.php/index…/t-1140673.html) but before i do that i want to be sure i know which disk to select of the four that are showing up. Hello and thank you so much for your help! It seams even using the sudo command that I can’t write restored partition to the drive? I have been searching for over a day now trying to recover this drive and I don’t know what to do… if you have any insights that could help I would appreciate it insanely… thank you again! If my partition used to be GUID, it’s considered Intel, correct? I’m trying to expand my boot camp windows partition, but I converted my disk to a dynamic disk accidentally. Now my entire disk in my iMac is a dynamic disk, and I’m not able to boot to OS X. How can I revert the process without the loss of data? I’m able to boot Windows 7 but I don’t know how to resolve this problem without losing all my data in mac partition. I tried use TestDisk but I don’t understand how to use it especially when choosing which drive/partition and partition type. I’m not sure of it. I’m also getting the resource busy message when pdisk’ing into /dev/disk0, any suggestions? HOLY MOTHER OF GOD THIS WORKED!!!!! I cannot believe it! I had tried different softwares at $100 each all claiming to be able to restore lost partitions (and sure they would DETECT the lost partitions but there was no hope of actually been able to RESTORE them!) but none of them did anything like this! Literally when I finished all the above steps my entire hard drive (1 Tb Lacie) was restored with everything EXACTLY the way it was before the hard drive crashed! I cannot thank you enough – seriously you are a life saver and just made my week! Cheers 🙂 ! 🙂 ! Man, you are my hero!!! I tried every kind of recovery software, i’ve also bought DataRescue3 for Mac, didn’t work, but now i have 70% of my partitions restored, i don’t know what happened with the other 30%, but it’s already perfect. Thank you so much, brazilian regards, Rodrigo Maia. can you describe how you used gpt ? Thanks MAN! It worked on my HFS partition! For a strange reason disk utility saw it as unallocated space…. and disk utility seems to see them as HFS partitions…. “The map is not big enough”. How to perform the entire process, step by step. Stress eats me because I have important files. You are AWESOME! Certainly my HERO! Your tutorial did the trick mate! Thank you so SO much!! Just a word of warning for others in case they are thinking of using other recovery software. I bought Disk Drill in a panic buy yesterday. It recovered the files, took 17 hours and they did not have ANY filenames and NO folder structure! What a useless piece of software! I had 300,000 files with no names!!! Utter rubbish! Hi, I have the same RESOURCE BUSY problem, can you help me please? you are an uber hero. One you were a hero to your friend, then two you were a hero to people you don’t know. Then three: you gave us the power to be heros too. I did exactly what @Barry (2012-03-13) did. I am just wondering if I should copy and enter ALL these info, or if I should enter every-other one, since there are some duplicates on these results. I have copied and pasted the screen results below, I’d really appreciate your guidance! O gerenciador de discos do windows 7 (via bootcamp) alterou o tipo das partições do meu mac, onde todas ficaram inutilizadas. Tentei diversas ferramentas, inclusive o proprio TestDisk, mas as dicas complementares deste blog salvou meus dados. Valeu demais! I’m having the same problem with resource busy. I’m booted from the Snow leopard install disc. HFS+ partition table won’t boot after re-imaging with clonezilla. Any ideas? hi…i’ve got a little problem with my WD 2TB hard disk…it’s full of my data, photo and video but when i try to copy come files, an error -36 appers from the finder…this happend only with some files, not all…i’ve tried to repair with disk util,but nothing works, the error -36 still apper…tried to fix with partedmagic, but nothing went well…so i want to try to fix the partiton that maybe solve the error -36 from the finder and i read this article.. So, I only want to know one thing: the pdisk command will delete all my data(documents,photo,video) or it will preserve them and fix the partition!? thanks for the reply…please help me folks! As I can’t boot OS X and I don’t have a recovery disk right now, can you tell me what is the linux equivalent of pdisk? Also, will it work on an MBR formatted disk? Need a little help here, Im stuck right after Step 7, apparently I am not a “man” haha. When I close Testdisk and enter “sudo pdisk /dev/rdisk1” into Terminal, and I get “Floating point exception”. Any help would be appreciated, I have over 500gigs that I need to recover, and it took me 5 days to run Testdisk! This is definitely the most helpful site I have seen about using TestDisk and pdisk, and is really helping me. Funny, because last night it worked, I was getting the place to enter First block, but I just went back to TestDisk one more time to check the figures, and this time it is different. Also, does it matter if you analyse/try to restore disk1 rather than rdisk1. Hi I am having the same “can’t open file ‘/dev/rdisk1’for writing (Resource busy)” error at step 9. What do I do here? Also, can you tell me the difference between disk1 and rdisk1? I selected rdisk1 as you did, but I’m not sure why. I am trying to recover an exFAT partition that disappeared after doing an Apple update. The first (HFS+) partition still works fine – it has Lion and applications. The exFAT was my data partition, and then I had unpartitioned space for a future BootCamp partition. Now DiskUtility shows the Lion partition and then a MS-DOS(FAT) partition called DISK1S4 taking up the rest of the space on the drive. I have attached it to a different Mac to do this, so I am not booting from the drive I am trying to repair. I got around the Resource Busy problem by going to Disk Utility and unmounting the partition. Then the command worked. Am I supposed to skip the EFI System Partition, or what? I know the numbers are correct, because I had copied and pasted the info to TextEdit and copied and pasted the values from there. Did you ever figure this out!? I am getting the same issues you got and can’t fix the issue! Thanks so much! check my response to Michael Sprague below. This post is a potential lifesaver. But please would would you update the main body of the text to include the warning about having to use gpt instead of pdisk on disks with GPT partition tables? Unfortunately although pdisk had failed with the partition map not big enough error, it had converted the partition scheme to APM. And then the gpt command wouldn’t add partitions or create a new map (not even with the -f force options) or destroy the existing map. which said that iPartition http://www.coriolis-systems.com/iPartition.php was able to change the partition scheme (including from APM to GPT). Luckily I had purchased iPartition some time ago so I gave it a try. After setting the partition scheme back to GPT, I used the gpt instructions above to add back the partitions based in the information that testdisk had displayed. Now all my partitions seem to be readable again. Nothing I have tried works. I have never used Terminal before and fear I’m not entering the command at the right place. The external HD is a Lacie and I use a MacBook Pro older model. I would be eternally grateful for any help you can provide. Thank you so much for your time! I have a similar problem to George Hickman (2012-07-18), I enter the numbers just as they are but it tells me they are a bad size. What am I doing wrong? or what can I do differently? Try using /dev/disk1 instead of /dev/rdisk1 it might work, have you confirm with disk utility that you are using the right disk? Thank you!!!! I nearly lost 12 years of my work, which I stupidly kept storing for the past 2 years at Iomega external HD without additional backup. Apparently if you forget to unmount an external HD under Mac OS it could damage HD’s partition table. That’s exactly what happened this evening, when my incidentally knocked off a USB cable [arrrhhhhh]. After re-inserting the HD back I saw that scary message “the disk you inserted was not readable”. Following your suggestions I managed to get all my data back. THANK YOU FOR SHARING THIS WITH THE WORLD! I am attempting your instructions but when I get to step 4, the Seagate GoFlex 4TB drive does not appear. I just see the imac’s hard drive. On the terminal it mentions that I should be the root user. I assume I am. There are no other drives connected at this time. What can I do to have Testdisk detect the damaged disk? It appears on system profiler. “P Unknown Start 0 end 429463199″…. Does that mean everything in my hd has been deleted? Im kinda stuck at there… I still tried using that pdisk command though, since i have the start block and end block values, but when i tried calling for the commands, the commands could not be found.. Thanks for the info. I have run into a problem though and it doesn’t seem to be working for me. The first time I ran through the process the screen shots were similar to yours but nothing happened. So I tried again and the following times the testdisk screen showed me more partitions at the beginning, before analyzing the partition (partition map, etc). I could still do the steps. Once analyzed and in terminal, the info changed from what it showed in step 8 before. It woulnd’t say that there is no valid block. I can still go through the steps, but it asked me to initialize first. I do and still no success. Any help or ideas would be appreciated. I am working on a 16gb flash drive. I ejected it from my computer, the icon disappeared from the desktop and then i removed it but when i plugged it in to my laptop i got the error message. Yes, I can confirm, you’re a Hero!!! The problem I had was a home made RAID Box using a SATA Raid Bridge board from SPAN.com (http://www.span.com/product/Firewire800-USB2-eSATA-Bridge-Board-UFS-DSATA210-PLX-Oxford-OXUFS946DSE-LQCG-chip-for-2x-SATA-HD-Normal-RAID~34369). I previously had a pair of 500Gb SATA drive in RAID-0 as a backup/temp storage location while I was shuffling files around various machines and external disks. My Mac Mini’s hard drive starting failing (S.M.A.R.T Attribs. showing issues and machine slowing with lockups too). So I used the Bridge Controller board with another SATA drive to backup the Mini – but I needed to change the Mode of the board from Raid-0 to ‘pm’ (Just a Bunch Of Disks – JBOD) as there was just one drive connected. After completing the backup, I forgot what the previous setting was and the board re-initialise the pari of 500Gb disks! After hours of downloads and testing apps. – I’m a cheapskate as it shouldn’t be that difficult to rebuild a partition table with the right tools – my Google Foo got refined and I found this blog after reading about TestDisk. Once again, thank you Perro, faultless – just a shame TestDisk doesn’t write to HFS+ and still need to use pdisk. Incidentally, it’s back on Mac OS X Mountain Lion – I read Apple apparently removed it, or maybe the Migration Assistant copied it from my old MacBook Pro which initially had Leopard followed by Snow Leopard and Lion OS Upgrades). Hi, can I use this guide on Ubuntu or it is only for Mac? I recently had my USB 1 TB external hard drive get unplugged accidently, and since then I’ve had the “unreadable” error on my MacBook. I tried out this application, and while I’m not the most handy using Terminal, your walkthrough was perfect. The only thing is, it didn’t work. And I’ve tried now maybe four times. I was wondering if there was any further help you have to give as I want to try to recover what’s on this drive before just abandoning ship. Thank you again! It worked the first time but half way down entering it I missed a number in the partition start so had to start over.. now its happening every time. all I did was quit terminal and start over. Work perfectly. Thank you so much! You just saved my life. Thank you very much. I’m also running into problems at Step 9. Has anybody been able to solve this yet? Does the drive makes noises? It makes pretty much the same noises as a healthy drive, nothing out of the ordinary! I “lost” the partitions on the drive after I had to forcefully power off my mac because it froze, so I am assuming the drive isn’t dying from old age. I also tried with /dev/rdisk, same error..
Have you tried using sudo? are you sure it’s disk1? I put my 10.4.11 HD into the freezer. Clicking sound went away but I got the error: “The disk you inserted is not readable by this computer”. Because I’ve read there is only a short time to retrieve my data and every attempt causes greater damage to the HD, I’d like to know exactly what I should do before I do it. After the HD thawed, clicking started again. I now have a new HD in my mac but the OS is different from that of my clicking HD. Is my data recoverable? The experts couldn’t get it off the clicking HD. – Some have suggested going into TERMINAL and trying “diskutil list”, “sudo gpt recover /dev/(insert your hard disk ID)”. – Now I see the Testdisk option of this article. Any diagnosis/help would be much appreciated. Thanks for your great tutorial. It worked well for me up until the pdisk part. I got the same error that others had (can’t write to the disk, permission denied). I tried the gpt command as well, but had the same problem there. I checked to be sure and the disk is not mounted. But Disk Utility does say that it is “read only,” for some reason. Great instructions, and extremely helpful in correction a (incredibly) scary problem (corrupted partition table). Your detailed instructions, screenshots, and links to the tools (TestDisk) were awesome! I had almost given up as permanently lost (or, at least, terribly damaged and leading me towards hundreds of hours of recovery, renaming and restructuring work) almost 11 years worth of digital history (pictures, music, documents, applications, etc. ), and you saved me! Amazing tip. I haven’t read all comments, but TestDisk now can write the partition table. So no need to use pdisk anymore. Done all of that, but the disk doesn’t show up in finder. Could you give a hint what should I do next? I remember that even the first time I’ve got the “the map is not big enough” message – maybe this is the problem? Oh My God THANK YOU!!! I was trying to get my hfs+ external HD to work on a win7 computer and when I tried to reconnect it to my mac it said “Nope, can’t read it…”. And I had a near meltdown… When I was solid enough again to start googling I nearly spent 99€ for nothing. Thankfully I found your post!!! Oh my God this is so freakin’ satisfying! Thanks a million and once!!! Very Happy Greetings from Hamburg Germany!! Hey, man, just to say “thank you”. My friend came over with her non-booting Macbook Pro, I pulled the harddrive connected to my Air via usb and “boom”, no partitiions. I thought “what the…” and reading your case was almost like mine.. except, I put the disk back on and still no boot, not recognized (booted from MLion pen, no disk shows up). Pulled it off again and the partitions were still there, so we just made a backup copy of all the info and its up for repairs (second Mac I know that has the flat cable problem in like two weeks! – I’m guessing it’s the problem on this one, since everything else seems fine). A great big thanks to you. Macbook pro HD partitions missing after a bios fallout. Unallocated disk with only 32MB showing in disk utility. Recreated exactly as it was before this barny. Cheers. You’ve just saved my life. You really save my life!. Thanks a lot!! You really save my life!. Thanks a lot! Seriously you have no idea how loudly I am screaming right now. I haven’t been able to access this thing for MONTHS, and I was a week off walking out and buying a new one and just starting over. Thank you SO SO SO SO SO MUCH! AHHHHH! hey there. i’m not sure how current this article is, but noticed you mentioned emailing you so thought i’d give it a shot. I have a 250gb seagate external that I had allll my files on from college. I was working on a windows pc at that point. i got a mac and plugged it in and was able to see everything. I transferred one folder and all worked well. I later reconnected my device to my mac and it said it could no longer be read. my HD has been sitting in a drawer for the past 5 years as i couldn’t figure out what to do. Will this tutorial be a possibility for me with my current mac? will it hurt the HD in anyway if this technique doesn’t work? Scared the hell out of me doing it – but it worked! Thanks a bunch! Same problem like Tamar here (Can’t read block, Unable to write block). Any Solution? same problem here. how can we solve? Please add me as another happy user of your methodology. It worked like a charm and this has restored my faith in the Interwebs being a force of good. Merci beaucoup! This worked great, I think! I would just add that I had to modify your instructions a bit. I was trying to recover a 2TB drive with two partitions, and whereas you skipped over the block size prompts in pdisk, I had to change those. I used 4096 bytes per block, which seems to have gotten it to work. Before I was receiving “the map is not big enough” errors from pdisk. Can you post a screen shot ? We’ve made it to step 10, but can’t figure out what to put for first block ???? Can you explain this? I am having the same problem. I have a 2TB disk with one partition but it starts at 3907003948 with a size of 9396 it looks very small to allow the 2TB. One additional tip: you can have multiple terminal windows open. Just hit cmd-N.then you won’t have to write anything down since you can simply run the pdisk cmd in another window, referring to the testdisk window when needed. Well, The TestDisk part worked for me, but I’ve gotten lost on the p(diddy)isk section. My array is an 8TB RAID 6 (so two parity drives, 6TB of data). I just had to replace a bricked drive and now, even though the array has been rebuilt, OSX can read but not write. Every reboot gives me “OSX can not repair this drive” error. Hi, i have same problem that many people asked in comment section. it happened, now what should i do? i didn’t find anything in comments, hope you’ll reply..
Oh my goodness! This is probably the most valuable thing I’ve ever found on the internet. Thank you VERY much for what has been a PERFECT writeup on what to do when your partitions suddenly disappear. I’ve had the same issue to Scarlet, but her question was never answered so hoping someone will answer mine. I get through step 7 but when I go to Issue the command ‘sudo pdisk /dev/rdisk1′ using the correct disk name it asks me for a password, but I’m unable to type anything in anyway so that’s where I end. I’m not well versed in using Terminal so maybe that’s part of the issue, but I’d appreciate some help! Thanks!!! Nevermind! The password just doesn’t show even though it IS typing in . NOTE: repairDisk is deprecated, use repairVolume instead. I have no clue what to do, or how to run the program I download from you first step. Kind of just poking around at this point and know that’s not a good thing. This next step is where I’m getting confused. Do I need to do it? Do I have the partition information needed to fix it already? Or do I have to go through the search? In any case, I’ve started the ‘Quick Search’ and it’s been running for almost 48 hours. It’s finding all sorts of Input/output errors. I’m not sure If I should keep scanning or if there is a faster way to get this drive (or data) back. Is this scan going to go through 3 Billion+ sectors until it finds what it’s looking for? I’ve been trying to accomplish your guide in order to save an external drive that suddenly isn’t mounting, it appears in Disk Utility but only the drive name itself and not the (only) partition he has, HFS+. I’ve cycled through all the comments and found one similar to my problem but there was no answer. I keep getting Floating Point Exception after typing my Password, required to run sudo pdisk /dev/rdisk6 (rdisk6 in my particular case). Also couldn’t get any help in Google. My friend, thank you for your advices, is very help full to me. i preciated that. Hey do you think you can help me restore mine? Great page here! Like many, though, I’ve run into a block because pdisk isn’t that well documented for all situations. I’m desperate because mistakenly erased a couple of HFS+ drives in Leopard 10.5, and I worry about making things worse by selecting the wrong pdisk options. Basically, I’m looking for some more detailed documentation and tutorial stuff on pdisk. Any pointers would be appreciated. Heyy, Thanks for it.. my system is working back.. But Now, there is one more problem.. The Mac OS on Disk 0 is opening, but when I reboot to install windows, there is no seperated spaces, also Mac OS partition, its united.. Sorry, I forgot – “The map is not writable:” happens when the disk is still mounted. I unmounted and eventually figured out the following from a few interenet searches and held-breath experiments. – gives me data without destroying anything. I finally had the data that our host describes. I followed the rest of the instrructions. Unfortunately, while the partition shows up, as it already did before, none of the files are there. So, as far as revovering the lost data, this didn’t really help. Oh well, but I hope my experience helps anyone else struggling wth this. Can anyone please help me recover my erased partition! Please!!!! but it keeps saying, “no partitions found or selected for recovery.” any thoughts? and once again underneath Partitition, Start, End, and size in sectors…it was blank. the scan took roughly 18 hours. what is my next step? Be careful with pdisk utility! and pdisk doesn’t seem happy once I enter any combination of these. Advice? repairing an external firewire drive (4 TB) with a single partition. perhaps this cannot handle 4 TB disks? This can’t be solved using pdisk, because your current partitioning table is GPT because it has the EFI partition and it starts from block 40, while pdisk creates an APM partitioning table which ends at block 64. Ran testdisk on a 2TB drive that had two HFS+ partitions on it, and it only showed one big one. As mentioned before, I used my Mac OS X Disk Utility to erase the drive. I started a Deeper Search, but I don’t think that works on a HFS+ setup. The results so far don’t look helpful. I used a commercial recovery program to find and copy files from the single-partition drives, but I’m uncertain about how that will work when the two partitions don’t show up via testdisk. Finding answers to this type of problem is depressingly difficult. To avoid the “can’t open file for writing… resource busy”, you have to unmount the volume from Disk Utility after being entered in the pdisk utility but before issuing the “i” command. However, I did some tests on an Intel iMac with a 80Gb disk that I formatted as GUID HFS Journaled with Disk Utility and left the disk empty with no data. I then ran the pdisk tool and did what’s explained above by Perr0. Although it works and seems to be recognized by the Mac, the partition map scheme seen in Disk Utility is then an “Apple Partition map” instead of a “GUID partition table”. I don’t know, how to thank you for this information. We were unable to decrypt the certificate id. Listen…. THANKS! Oh snap… You made my day with this tutorial. Bless you! I wish you the best man. All of my data is back now. Thanks again! ps. I have done it on Late 2008 Macbook Alu with OS X 10.9. Hi, I’m new bee in this, I removed my partition map by mistake. The first thing is what you call your machine, if you named it. It may have a default name, I never pay attention to those. The “:” is followed by a “~” (tilde) which indicates that you are in your home directory. Your username is what the folder is named that you go to when you select “Home” from the Go menu in the finder. Rather than guess at yours, I precede the parts to type with “>” The rest is narrative/direction. First. start the terminal by double clicking it in the Applications folder, or if you have dragged it to the Dock for easy access, click it once. You will likely see no change, as it should boot up with your home directory as the working directory. All lower case: LS space hyphen LA. The “a” is the message to the OS to show you All the files, without that it leaves some out. Which is fine for our purposes. Examine this list. It is probably sorted alphabetically, so Downloads is near the top. and then the list command again to see the volumes/disks your machine recognizes. TIP: Type cd Dow and, if there is no other folder/directory that begins “Dow” (and capitalized/not capitalized are enough difference) then it will complete the name for you. Hit and you will be in your downloads directory. And you will see the files there, including, I think, the one you are looking for. Man, you are a Genioussssss !!!!! Saved my Neck !!!! Thank you !!!! I am donating of course !!!!! Many thanks to Fam. Just rescued a disk coming out of a malfunctioning LaCie Big Disk mirror. Partition table was gone and already replaced by an APT table. TestDisk found the original partition. iPartition was able to change the partition scheme back to GUID. gpt was able to destroy and recreate the correct partition table using Fam’s instructions. I’m not able to fix this. Now how can i fix this. Can anyone please guide me step by step. You mean from testdisk, not from pdisk, right? anyways, this can’t be solved using pdisk, because your current partitioning table is GPT because it has the EFI partition and it starts from block 40, while pdisk creates an APM partitioning table which ends at block 64. 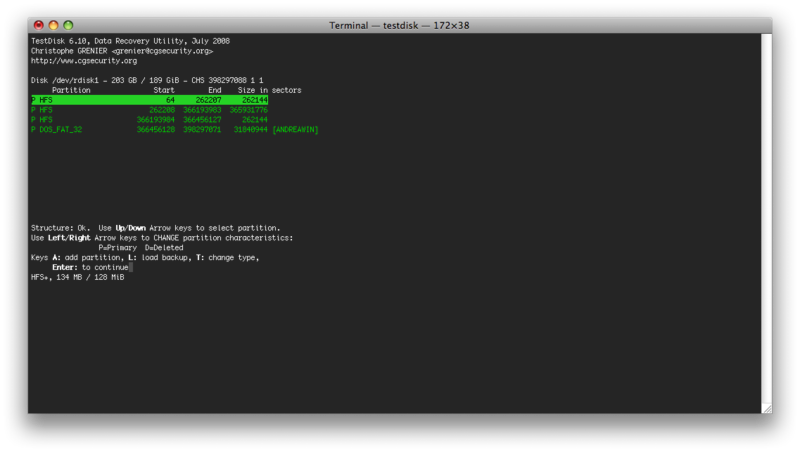 Open terminal, type “sudo gdisk” and it will run. Mine said it found a valid GPT but with corrupt MBR. I typed “w” to write the new partition and rebooted my computer. My whole drive came up with all it’s partitions in tact. Voila! Please someone update this for us not terminal users … Maybe a youtube video ? Parallels was definitely the problem here !! Ok we finally got it to work. Some of your instructions aren’t clear after step 7 or 8, but we got it. We used the instructions from CGsecurity.org as well. Step 10 – no need to copy & paste or handwrite the info in from the testdisk-6.14 analyze test. Just hit enter twice and the screen shot should look just like Perro’s step 9-10 pic. For privacy reasons the ***** are deleted names. Thank you so much for posting this and want to reward you for your great efforts !! Please email me when you get a free moment, we have a gift for you !!!!! I had a 2 TB WD passport that I accidentally deleted the partition of, and this saved my day!! OMG – Awesome stuff! Worked perfectly! Did I just flush my data down the drain for good?? It sounds like I had the exact same issue as your example case – preparing to partition SSD in my new fancy schmancy MBP partitioned a little bit of the external disk (with, essentially, my whole life on it) for the wininstall partition, and then it overwrote the partition table for the entire disk when I was foolishly trusting it to only use the portion I had set aside. Oops. Like your example, I immediately unplugged it all, and started looking for solutions. Google+ yielded the link to this page (thanks Matt R.) and I exulted in what appears to be the solution to my problem. So, I thought perhaps if I put my volume name (two words) in quotes, that might help. New response: requested base and length is not within an existing free partition. So, I feel like I am very close to avoiding my appointment at the local Genius Bar by fixing this myself and so being able to cancel, but I am not quite there, and I kind of expect that my affable neighborhood genius is kind of likely to completely fubar this. I tried just entering the volume name as “Crime” to no avail. New response from above was repeated. Anyone here have any ideas? If you are talking about your MBP hard disk, then I think you and I have the same problem. The problem is that new MBP are partitioned using GPT “GUID partitioning tables”, which takes 40 blocks then most probably have an EFI partition (around 200MB) that starts from block 40. I would like to get my bootcamp back, but so far, I can’t find a way to convert APM to GPT, so I might have to copy my data, format my whole drive and repartition it. But in your case, if you are fine with only your OSx, then you should just skip the first partition as I said and you should be good to go. it worked, you saved my entire photo collection 😀 thanks a lot! That is great. This week I start work, and will gladly donate once I get my music library back. So far I have not been able to get this to work for me, which seems odd, since I did the exact same thing your friend did, and I have followed the instruction exactly. I had two external drives connected and was about to backup my photos from the last couple of months. I meant to change the partition structure on the backup drive (it was previously used for something else) and accidentally deleted the partition table on the drive with the photos!! Testdisk has improved since your article and I didn’t have to use pdisk. Basically once I found the partition I just told it to write the changes. Testdisk isn’t super clear if you haven’t used it before, I was expecting the deleted partition to show up as D for deleted but it was displayed as P for primary but the website documentation is okay if you take your time and read it slowly. I just dded over my external HDD, and found this promising guide. Can you please put up a Dogecoin wallet address to donate to in case this works out? Thanks!! You can read about dogecoin in the link I entered. I am 100% serious by the way! After following carefully these directions, I keep getting bad size, bad name and requested base and length is not within an existing free partition error messages. and then execute the sudo command. You’re my hero! Thanks a lot. Got the same problem, a 1.5Tb drive that lost the partition map. Went crazy at first, and then found your post. While your solution didn’t help me, it pointed me to Drew’s post, and that really saved my day! And I cannot continue from there. But Now, there is one more problem acquired.. The Mac OS on Disk 0 is working as normal as before, but when I reboot to install windows, there is no separated spaces, also Mac OS partition, its all united..
consume foods that contain RGCG keep themselves detoxified. LIFESAVER!! THANK YOU!!!!!!! poor student else i would definitely donate. EVERYONE LOOK HERE if you have a 2TB external Drive. If you have a hard drive over 1TB, it’s most likely have been formatted in HFS+. It most likely has a sector size of 4096. Therefore, you have to change the geometry of the drive. 1. Choose [Mac] or [EFI-GPT] (doesn’t matter). press ‘w’ and you’re done. I tried to read some files on my PC from a 500gb External WD formatted from a 2008 Mac. In trying to get the PC to read the disk, I accidentally initialized the drive on the PC thus rewriting the partition. It showed no files whatsoever neither on my PC or my Mac. That tutorial was a little clearer on the pdisk portion. I double checked that I had chosen and written the correct drive (in my case it was dev/rdisk1) and selected “Y”. After entering “Y”, the rest of the steps are exactly the same. After step 21, it will show a warning that writing the map destroys what was there before. I selected “Y” and after writing “quit” on test disk my drive popped up on the desktop! I followed the this tutorial for the testdisk portion and the nathanhein.com tutorial for the rest. This was pretty straight forward and saved my drive!!!!!! Thank you for this helpful post. Note to others: in my case it worked when I selected /dev/rdisk1. Thanks. Worked like a charm! I’m still a bit confused about what goes with Apple Partition Map vs GUID and a few other things. We have a 1TB HGST HTS721010A9E630 laptop drive, that was accidentally “Partitioned” used 10.9 Disk Utility with a single HFS+ partition. It used to have more than one HFS+ partition. Daniel suggests changing the Geometry settings for larger drives. The datasheet says this drive is an Advanced Format drive with 4,096 byte sectors. So that is what we want for the Sector Size, but I don’t see where one gets the number of heads or sectors. His example is 255 for Heads, but does any drive really have that many heads? Mazen suggests using gdisk instead of pdisk for GPT disks, which I would think this would be. But more people seem to be reporting success with pdisk, then one would expect given how long Intel Macs have been out. Does this matter? Lastly, when I run TestDisk, I don’t just get four partitions like Perro and some of the others show, I get quite a few more. This drive may have had some .dmg disk images on it, is that the cause, or are these likely real partitions? And how do I tell the new partition accidentally put on by Disk Utility from the ones we want to recover? I a new for Mac. Amazing. Thanks for this guide. I followed your instructions, but got the ‘map not big enough’ error, on a 2TB drive with a single HFS+ partition. Then, after two days of puzzling, I realised that testdisk was detecting/hinting that it was a Mac (Apple partition map) partition. But a recent drive of that size should use the testdisk EFI GPT partition table type. So…I restarted testdisk, selected EFI GPT, found the partition, and testdisk wrote the new partition map for me and told me to reboot… It worked! 1.8TB of files and folders back online! And no need to use pdisk etc. I couldn’t have done it without this guide to point me in the right direction. Thank you! 🙂 I care for such info a lot. I was looking for this certain info for a long time. has anybody managed to get around this? testdisk seems to discourage using pdisk in a not PowerPC environment. I had already tried to do that, but every time I try to do so, I get the annoying spinning bach ball. Isn’t pdisk only meant to work under PowerPC? Well, at first I thought that my disk was toast and decided I would get a new disk from Amazon. After I got the new disk, I hooked the damaged disk up to my NAS, and to my deep surprise, it mounted just fine, and the data can be accessed with several limitations. Specifically, the data on the damaged disk is Time Machine backups, and, unfortunately, I can’t get those backups over to the new disk (attached to my Mac OS X) because the NAS published the data over AFP which isn’t friends with symbolic and circular links and other stuff to be found on Time Machine backups… Just to be clear, I connected the disk to my NAS just to discover a linux was able to mount the disk. All the steps I report here or on the Apple site are issued on the damaged disk connected back-to-back to my Mac mini. I’ve just updated the post on the Apple site with more details. An you are the Hero – that for sure ! Don’t plug the device, under what ever circumstances, in to a Android TV Box! It looks like Android 4.x identifies the device as empty and format it with a nice FAT Partition including DOS partition-table. I did as you adviced but the result from testdisk is very messy. So I do not know what is next step. Could you please help me. This HDD has all my data. Thank you very much. Warriors top rate & fashion origional design for our kind customers with no tax. sharing in delicious. And naturally, thanks on your effort! After several “analyse” that only revealed my “P Mac HFS” partition (when I ran EFI GPT option) out the 3 that I originally had, I tried to analyse with the unformatted option selected. Then I got this message. ex-fat and mac journaled I think. Is there anything else I can do or did I lose everything?? Did you create a new partition table with just 1 table on your disk before attempting this? Like formatting? No, I didn’t do anything like that, or at least not intentionally! If you mean, before the breakdown of the hard drive, no. It was working properly, until one day my computer could not find it when I plugged it in. Sorry, I missed to post the whole message! Thanks in advance! Hi, thanks for the tutorial! I have but one issue. When I enter the command pdisk /dev/rdisk1 on step 8, I get a floating point exception. I don’t see this covered in your tutorial, and I wanted to know if you had any knowledge on resolving this issue. Thank you. Hi, I’m kind of desperate here since I accidentally erased the partition on Disk Utility while trying to erase another disk, and it was replaced with a new partition. To make things worse this macbook is from a client, and I’m really worried about it. I followed all your instructions, but the only partition I get to work is the new one, which have overwritten the original, so the files are not there. I also got a lot partitions with close “start values” from the new partition in testdisk (all with the same size in sectors), but I tried all of them (about 15) and all of them renders an unreadable disk from Mac OS X. Do you have any idea on how could I get my old partition to be read instead of the one that replaced it? I followed the instructions and it didn’t work for me, so I think I’m missing something. If anyone feels that they have this down please let me know. I’d be willing to pay someone who’s really good at this to re-write my external hd disk partition. It could be done remotely with jabber screen-sharing. This is my last resort before throwing the HD in the garbage. Thanks! Mate, you are a legend. Thanks – so, so much! Just want to say that your instructions also saved my day, 500 GBs resurrected 😀 thx bro. Hi! 😀 I did as you instructed and I just wanted to know if ‘Writing the map destroys what was there before. Is that okay? [n/y]” is what I should get after inputting ‘w’? Please let me know. thank you! Thank you for the quick reply! I followed through but it didn’t work for me. Perhaps I am doing it wrong? I am not tech savy, so I can go through the beginning steps with you? 1. I download the test disk and I click on testdisk. Then I create a new long file. how do I know which media to choose? What is the difference between the choices? 3. Do I select proceed or sudo? P.s. Sorry for the silly questions due to little knowledge of this language. I never ever say thank you. But, you saved my life’s work, and I love you. technologies after that he must be go to see this site and be up to date all the time. I haven’t gotten this to work just yet but it did give me a bit of hope that my external hard drive (WD My Passport for Mac) is still somehow alive. (Although, it says the partition’s just around 1.0GB+ when I’m pretty sure the contents are WAY more than that. But anyway, I’ll recover what I can. Anyone know how to fix this? I’d literally owe you my life. Please help me. Hi Ed, you can’t write to the same disk form which you are running the OS, so rdisk0 is not the right disk to use, check for the right name of the disk you want to fix. I have tried rdisk1 too.. Using pdisk is now not an option because this is only for clock-old PowerPC HDDs, not for the Intel System, which is since long the Mac System. did the trick, analyzing and writing and all data were back. pdisk is not needed here, because TestDisk can write on the actual Intel EFI GPT partition table type. I’ve heard such great things about this blog, and now that I’ve stuffed up my hardrive, i was glad to fins this page, however now i’ve hit another road block I’m wondering if you will help me through. If you have any ideas, please feel free to email, i have some photos on this disk i’d like back! I was a Hero too. Thanks! And have a nice week. YESSSSS!!!!! Thanks a LOT. That’s all I can say…. You are a gernius! It worked like a charm and saved me $100 and a lot of aggravation!!! One minor clarification. Since it is possible to have 2 or more open terminal windows at the same time, there really is no reason to write anything down. Simply keep testdisk open at the drive in question and you will see the “start” “size” and “end”. Your way works as well but my penmanship and ability to accurately transcribe are often called into question! So with 2 windows open, all that you need to do is copy and past. At least for me it’s much safer and more accurate. I have never written to thank someone on a website before but I just want to say a very sincere thank you!! This worked and now I will make sure I backup my data more than once ha ha!! There are still decent people out there looking to help! You’re a star!! I would appreciate it so much if you’d try to help me with this! First off, thanks for the excellent guide! Sadly, I’m having the same problem some other have: The TestDisk search seems to run fine, but it detects an Apple/HFS partition instead of an EFI/HFS+ combination. So if I follow your guide, I do end up with a recovered partition, but disk utility tells me its defective and needs to be erased. Checking the attributes, I see that it’s defaulted to an APM, not GUID. What do I need to do? Thanks for the guide and additional help. Similar to above I am now stuck with an APM instead of GUID after trying to recover table/partitions. There’s a bit more to it, especially how it all started but that is too much info to list here so if you would be so kind to email me back I will explain more in detail. One thing I noted that were slightly different than your directions – i was asked to select the partition table type. (efi gpt, Humax, Mac, None, etc) I chose mac (external is used on macs) though now wondering if this might be the source of my error. Also – would be helpful to clarify which media/discs to choose from. I used a process of elimination – choosing the, and seeing if there was write access, though there were at least two accessible, of which the “none”partition was detected (alongside a note that said this was very rare and not to select it). Thanks bro. You saved my entire work – better find a good cloud based app for backup. I’m in a major bind, deleted the main partition on my drive and formatted over it. At the same time, locked out of all backups on iCloud, because I enabled 2 step recovery and it does’t work. Came across this blog and you seem like the only one with the right answer. Hi! I just wanted to express my sincere gratitude for your awesome tutorial! Is there a way to determine which disk to use? I attempted disk1 using your instructions but my hard drive still wasn’t working. I guess it was maybe the wrong disk. Then I went into teskdisk again and more options came up than the initial testdisk run. I then selected rdisk1 and it seems to be taking quite a long time to even get past 0%. How long does this typically take? Should I continue to let it scan? I’m almost there and have not yet lost hope. Please help! I’m so thankful I came across your post! Your explanation and direction were perfectly clear for someone like me who uses a mac but almost never touches the terminal. I had a 750 GB, 4-year-old Toshiba Canvio drive that recently stopped showing up in Finder (I know, shame on me for not backing it up at this point). Disk utility shows the drive but not the volume. Repair options along with most other functions were grayed out. The drive had only one HFS partition with no human error in operating it as far as I know (besides maybe not properly ejecting a couple of times). I even tried a new SATA USB adapter to check if the interface was the issue to no avail. After following your directions, TestDisk worked beautifully. Some steps did take a while to complete, but immediately afterwards, the drive showed up in its original form under Finer. I didn’t even need to unplug or restart. Thank you so much for giving us hope of repairing our own disk without spending at least $100 on a software that may or may not work. Thank you! Thank you! Thank you! I’m trying to follow your tutorial to fix an external containing Time Machines backups. However I get the following error in Testdisk. From what I can tell there isn’t any partition from the drive mounted. And if I choose to continue i see this. I have a weird problem and it all started after I was finally able to get Windows 10 to upgrade my Windows 7 bootcamp. I had been using the paragon HFS+ tool in Win 7 and have it installed in Win10 now. Before I had it installed I tried to open up my external drive that’s formatted in HFS and accidentally incorrectly initialized it in Win10 Disk Management. I thought I had lost everything since Win10 was showing it as entirely unallocated with no partitions on it but booted back into OSX and it all was fine there. I did use the disk utility to check the disk in OSX and it did say it needed to be repaired so I repaired it and it continued to work correctly in OSX. I thought it had been fixed but back in Win10 it still showed as unallocated, I installed the paragon HFS tool thinking that would fix it but still no go. So as of this time it’s still working correctly in OSX but not showing in Win10, I’m not sure if it’s completely healthy or not or if there is an issue in Windows. My main OSX drive is showing correctly in Windows though without any issues, it’s just this external drive giving me issues and only in Windows. Any suggestions I could try? Was able to fix it but had to get another drive to transfer my files to. The drive somehow ended up having it’s partition table turned into APM somehow which wasn’t readable in windows but was in osx, so had to reformat it to MBR. 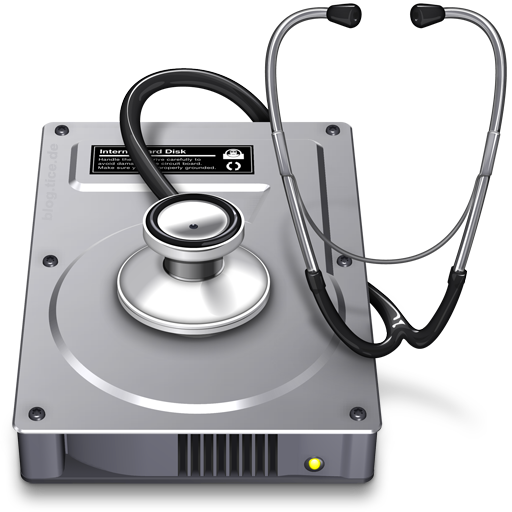 I mounted my OSX Journaled hard disk onto a Windows machine, Windows didn’t recognize my disk (because of HFS format). I wasn’t aware of HFS Explorer or any other programs that could access HFS drives on Windows. Naturally, I launched Disk Management and it prompted something (like use it as a dynamic disk or basic) to which I clicked yes (like an idiot). and then it gives me Quick Search instead of Quick Analyze. I then hit Enter, it scans through and It keeps going for hours. Thank you Perro. I sure hope you could help me out here. HOW CAN I BUY YOU A DRINK. them to the corners to combine them with the ones already there. Yes, it’s true but unless you’re using epoxy-based grout, the grout has to be sealed. Because of a mistake, I’m trying to recreate my erase partition table on a 4TB disk. So it sees half the disk! How can I create the table with that problem? Luc, I had the same problem. Were you able to resolve? You are an absolute GENIUS! Saved my life after I stupidly initialised an external HFS+ drive in Windows. Worst of all it’s not even mine. I was given it to partition 50:50 for use with OS X and Windows. Now need to find out how to delete the fat32 partition (not detected in Windows for some reason) and make the drive whole again. I won’t be trying again that’s for sure. The owner can buy another drive for Windows use. Thanks for the good writeup. It in truth was a enjoyment account it. Glance complicated to more delivered agreeable from you! However, how can we communicate? I wanted to buy you drink, but it seems that it will be little bit delayed. I am using OSX (10.6 and 10.9), I had a 3To Barracuda on USB Dock with EFI and 3 HFS+ partitions. How can I correct this ? I’ve used testdisk, pdisk and gpt as describe below, and I am still in bad situation, because of this bad capacity, isn’t it ? After I’ve tryed to became a man … unfortunatly I have pratique little bit more. With disk : I’ve rewrite the EFI partition, which became HFS+, I guess, and testdisk couldn’t find that the disk had a previous EFI. With gpt : I’ve install EFI partition again, now the testdisk accept the disk as a EFI/GPT but can’t see anymore the 3 old partitions. This seems a normal effect of the rewriting EFI partition isn’t it ? The result is a bad partition table, and a 800Gb disk to erase 🙂 when trying to mount it. I am having a “the map is not big enough ” problem. and here is the process. AS i have read the comment above , someone say that the block should be 4096 bytes, may i know is it relevant ? Hi I have a similar issue to the one describe above except it is a SD card (which also has most of my life on it) and it has a single partition in exFAT. Can I use the same process to repair the card ? Do I need some extra steps to do this ? this is the best HFS+ repair in the internet. Worked perfect. Many years of Pictures came back to life. When block size is changed correctly hit OK and only then run ANALYSE and you’ll get totally different “Start End Size in sectors” numbers. Then using THESE numbers in pdisk you won’t get “the map is not big enough” problem and you’ll fix your drive easily! Good luck! I get a lot of emails asking about the block size, thanks for sharing the table! I changed the block size and still shows the map not big enough…What can be the issue? Do you need to save the change block size before closing tesdisk and go to pdisk? THANK YOU SO, SO MUCH! THIS REUNITED ME WITH ALL MY STUFF ON MY ONE AND ONLY EXTERNAL HARD DRIVE, DURING A WEEK WHEN I REALLY NEEDED TO ACCESS SOME IMPORTANT FILES ON IT FOR A PROJECT TO WORK ON! HERE’S A DONATION FOR ALL YOUR HELP! MANY PEOPLE OUT THERE ARE STRUGGLING WITH A SIMILAR PROBLEM TO WHAT I HAD…THIS SOLUTION SHOULD BE BETTER PUBLISHED! Trying to bring back 4Tb portable Seagate drive. Until disk everything worked. “size of ‘device’ is 0 blocks” whatever I try. Thanks to TestDisk, that I found thanks to you, I recovered my partition. Thank you! I came to this site like many of the others here trying to find a way to retrieve my precious documents from my external hard drive. The problem started when I didn’t properly eject my hard drive. It is a 1TB drive divided into 3 parts. Currently I can read and write to only the FAT partition. The other 2 HFS partitions only show up as Untitled and can’t be read. Any help would be wonderful. thank you so far for your tutorial. I accidentely formated my HFS external hard drive with exfat4. now i try to get the data back. my problem is, the it needs a lot of time to scan the harddrive. It will probably need 24h to scan (2TB). is this normal? or am i doing something wrong? Did you tried the fast scan first? Did it yield any results? I did a quick search but it Listed two HFS Partitions with nearly identical Start stop sectors as “cant be recovered” with an error: the hard disk is too small. Might one of those be my partition? I accidentally erased my external HD with disk utilty. It was formatted as OS X Extended (Journaled) and I erased it using the same format. When I run the quick search only one HFS partition shows up, which I assume is the new empty one. Should I run the deep search? Thanks a lot for your reply. Using a data recovery software I recovered everything but without file names. But I have 2TB of files, which is a nightmare to reorder. After doing a deep search with testdisk a few hundred HFS+ deleted partitions show up. Do you think something could be done with those partitions to recover the folder structure? I highly doubt it, the thing with HFS+ (Hierarchical File System) is that all the folder structure (which was introduced with the + on HFS) is stored in a single place, and upon formating that information is wiped out and the rest of the data on the drive is ignored,, that’s why it’s so fast to format an HFS+ volume yet easy to recover data but without structure. How do I go about this? Thanks! Your help will deinitely be appreciated!!! I followed your and my HD is still messed up. Even more! I explain my situation to you: my hd has three equal partitions. One of them doesn’t mount. Disk utility sees it but isn’t able to mount it and tells me to repair it. I don’t know how to recover the files before repairing. I followed your steps here but unfortunately it didn’t work. I have more partitions but the troubled partition keeps unmounted. What am I doing wrong? I appreciate any help. Does anyone know why the message the map is not big enough remains even after trying all sector sizes? It looks it should be 4096 for a 2TB external but tried other sizes as well. I could see from Data Rescue the full structure is there however it does not mount. Please any help would be appreciated. Thanks! From the JMCD case (June 2016), what can you say about the iMovie file structure? Is there good chances to recover at least the movie files in one piece? (Please say yes… 🙂 Thanks! What block size should I put for a 4TB drive? Thx for all this help. I’m dealing with two 4TB hdd that are likely to have gpt damaged due to unplugging hazard. I can also access data but only via diskdrill pro. Disk utilities sees a blank partition on each drive. I changed the geometry to 8192. But in pdisk it is still recognized as 512, so I have the same mapping size error. Most of the times this issue is due to disk manufacturers using different block sizes to increase storage capacity in their devices. Usually the way to figure out the right block size is taking the number of blocks from testdisk and doing some math around number of blocks and expected device size to figure out the right block size. What’s your disk vendor and model? Checking Journaled HFS Plus volume. The volume Boot OS X appears to be OK. File system check exit code is 0. Do you have any idea how I can get back my data? Checking volume bitmap.Checking volume information. Updating boot support partitions for the volume as required. Storage system check exit code is 1. Error: This disk needs to be repaired. Click Repair Disk. By the way repair disk never worked. Could you please help? 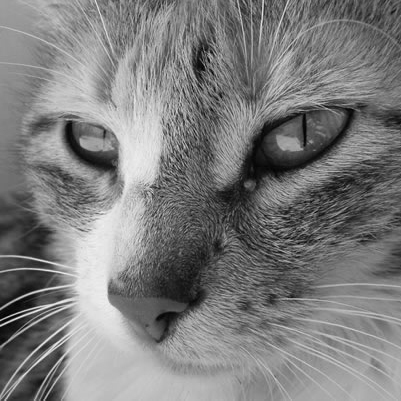 When everything had seems to end by the most awful way… your MAGICAL POST gave peace to my heart. Thanks a lot for your help!!!!! So this has actually happened to me twice in the last two months, on two different drives and I feel like I have gone over and over and tried everything in this thread and still no luck. The biggest question that I have that doesn’t seem to be getting answered is what could be an ideal default block size for a volume size that is 4TB. I’ve seen the question alluded to but no general answer. Also, and this is just me thinking out loud, but why has TestDisk been around for so long and STILL doesn’t support the HFS+ stuff? Like, what amount do we need to pay to get the creator to update the program and get that working? The block size for 4TB is really hard to figure out since it’s based on vendor/device. Would you mind if we use your article on our website – http://macsecurity.net? Of course, with the link reference to you. Thanks so Much Perrohunter. your method helped to me get all my data back from a cloned HFS+ HDD. It even mounted the hidden Recovery Drive partition. both drives have 4096 logical sectors. should I change them to 512 in Testdisk geometry menu? thanks for the help so far. I have seen several people asking the same question as I do, but could not find solution. The TestDisk runs quick search very slow. I presume it will run for several days with its current speed. Could you please tell me if there is a way to make quick search quicker? it is testdisk 7.0 I am using. Fabulous! Your routine worked for me on my recalcitrant external USB drive running Mac OSX 10.11.6 and testdisk-7.1-WIP. I had backed up my problematic drive beforehand using Disk Drill but this procedure is a great help. I have noticed you don’t monetize your site, don’t waste your traffic, you can earn extra bucks every month because you’ve got hi quality content. You are a GOD! Thank you, worked like a charm. I accidentally formatted an HFS drive as NTFS. I’m first recovering all of the data (which seems intact) to another drive, but is there a way to “reverse” the format and revert the drive to its HFS state? Yes, recovering the partition table with this procedure should rever the damage, but just to be sure do keep recovering all the data you can before attempting this as you are already doing. The data is almost finished recovering, thanks. How do I know what to list for the sector sizes? Is that something that I need to figure out myself? I’m concerned I’m not “expert” enough to do it and it’s best to leave the hard drive the way that it is, and let a professional deal with it. I’m having a macbook pro 15 retina early 2013, in which I’m trying to erase my ssd because high sierra osmy has been corrupted showing folder question mark. I can only access internet recovery. My ssd is detecting in diskutility as UNINITIALIZED. I thought that my ssd has failed, but when I erase it, it’s says waiting for disks to reappear at 50%. I tried pdisk command in terminal where I can initialize, write partitions to my ssd but that doesn’t show up in diskutil list. I did this because to check whether my ssd is functioning properly or not. I asked help from several forums they said to mount my ssd externally to a Linux through livecd and use gparted. the same problem occurs cant format using ext4 or fat32 or even hfs+. it detects as a unrecognized label and shows my file system as unallocated. Im slowly trying to understand the fact that my ssd is failing but my question is how can it detect or how can it initialize and write partitions through pdisk and I checked badblocks and no badblocks occurred in my process. Also when using dd in terminal it stated some records are in and some records are out like that. I just want to format the ssd and install a osx. Just checking in to say that this guide worked perfectly. Bootcamp hosed my partition table, I got the “prohibited sign” when booting up. I started in target mode with a thunderbolt cable to attach the drive to another mac, got the info I needed from testdisk, and as soon as I wrote the new partition table it was recognized. 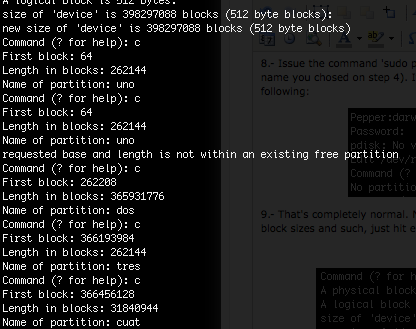 I got the “bad size” error when writing the first partition at block 40, but it still boots just fine. Thanks!! Thanks for recovering a RAID setup that appeared hosed! TestDisk was useful but didn’t have the option to repair the partition table, your pdisk instructions were the missing link and have helped greatly. Hope you enjoy the beers! Your website thrusts my CPU to 300% coz of CoinHive. How can I trust your instructions after this highjacking attempt? thank you so much for offering a glimmer of hope while I am attempting to recover data from my internal hd that seems to have been corrupted or lost the partition map and won’t boot up anymore, i dunno. It shows up in my disk utility but is grayed out and cannot be verified or repaired. I installed the os on an external drive and booted up from there. I’m trying to save the data that is on the internal drive and I followed your directions to the near end. I quit once it asked something like “Writing the map destroys what was there before. Is that okay?” because i’m not sure which data will be destroyed. Does this mean that all data on the drive will be destroyed? or just the data pertaining to the plots of the map? or just the data within the partition range? Also, i’m wondering why there was only one partition detected. I never partitioned the drive but it was the drive i used to run my OS. So shouldn’t there be two partition areas? one for the OS and the other for the rest of the data? I accidentally had overwritten the GUID Partition Table (on windows) and stopped seeing my HFS+ partition. Test disk was able to recover it! I didn’t have to run pdisk. After analysing the disc, testdisk gave me the option to write back the partition, just selected it and voila! You sir are a Hero. Ages trawling the net and loads of useless recovery software – should have come straight here!